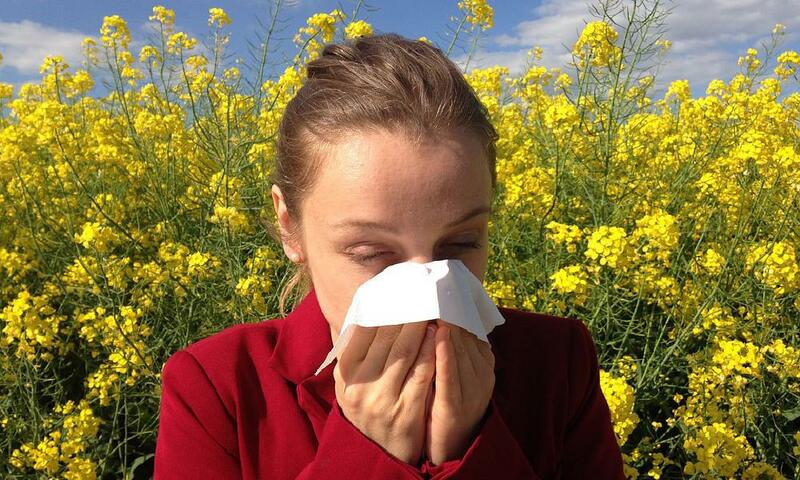 At this time of year, many people are suffering from seasonal allergies. The symptoms can include itching, sneezing, congestion and runny nose, headaches, red or watery eyes, and so on. They can vary from mild to severe, acute to chronic. Seasonal allergies, sometimes referred to as “hay fever,” result from exposure to spores or pollen released into the atmosphere by fungi, grasses, trees, and other plants. That plant material is mistaken for an invasive protein by your body’s immune system, leading to the production of chemicals like histamine. Histamine attempts to attack or expel the invader, resulting in the bothersome symptoms described above. Those who experience seasonal allergies are also intolerant to certain foods which they cannot easily digest. The poorly digested food is often regurgitated back into the respiratory tract leading to many of the allergy symptoms noted above. The big food culprit is dairy products followed by eggs, poultry, red meat, bread/wheat, certain nuts, and alcohol. With the immune system becoming increasing compromised with continued consumption of the biggest food culprits, the person become more sensitized to other food triggers and environmental triggers. Try to drink 2 to 3 cups of plain warm water upon awakening. Wait at least 30 minutes before eating or drinking anything. Stick with having warm meals eaten with a spoon and in a bowl. These meals should hopefully naturally contain water (i.e., green vegetables, beans, oats, quinoa, millet, mushrooms). Do not drink liquids while eating. Instead wait a half hour before drinking lots of warm water. Try to fast 3 hours before bed. Make sure to have 2 cups of water during the evening. Drink 1 cup of water before and after showering. When your sinuses are congested, rinse them out. You can load up a Neti pot with warm, purified water, and a few splashes of an essential oil for additional lubrication. The alternative is using a saline nasal spray. Do the nasal rinses twice a day at a minimum so that the nasal passages can remain moist and prevent environmental allergens from getting trapped in the respiratory tract. Apply Vicks Vapor Rub to the nares after the saline rinses and Obas oil (i.e., type of Eucalyptus oil) to the chest. They are good at detoxifying, purifying, killing bacteria, reducing inflammation, and relieving the symptoms of seasonal allergies. Quercetin is found in a variety of fruits and vegetables, most especially leafy green vegetables, broccoli, cauliflower, leeks, and spring onions. It’s a bioflavonoid which moderates histamine production and release. Bioflavonoid is an ambiguous term which used to be called “Vitamin P”. It is responsible for giving plants their pigmentation. The term now describes the broad category that includes antioxidants and anti-inflammatory enzymes. Quercetin has been tested in clinical trials. It has been shown to reduce irritation of the airways while improving one’s overall health. In concentrated doses, it can help to control the severe anaphylactic reaction to certain foods, like peanuts. It does take time to build up sufficient doses of quercetin, so those prone to seasonal allergies would do well to begin taking quercetin and load up on having lots of vegetables weeks or even months in advance of the allergy season. Then again, these foods are so healthy that it is best to eat them all the time. High in vitamin C, bioflavonoids, and antioxidants, citrus fruits (especially lemons) are extremely good for boosting immune response and preventing the symptoms of seasonal allergies. This is another of those remedies that works best in smaller, more frequent doses. Add a splash of lemon juice to olive oil, for a salad dressing, or add lemon and apple cider vinegar to a glass of water a few times a day, for regular immune support and symptom relief. Stick with having a small orange instead of drinking orange or other fruit juice. Eating the citrus fruit is significantly more beneficial to the immune system versus drinking the juice form. The butterbur plant, petasites hybridus, is grown best in wet marshland, damp forest soil, or on riverbanks. Butterbur extract is taken from the leaf, roots, or bulb of the plant. It contains two chemicals called petasin and isopetasin which help to reduce spasms and inflammation. It is the action of these chemicals that is thought to give butterbur its health benefits. Take PA-free Butterbur extract 75mg to 150mg twice a day during the course of the seasonal allergies. Stinging Nettle seems like an odd choice for improving health, but when properly prepared, it has been shown to treat all manner of concerns, especially including histamine overreactions and inflammation. It’s been widely used in natural medicine for at least a millennium, and probably even further back, as a tea, but common preparations now include tinctures or freeze-dried capsules as well. Advanced Health’s integrative approach to medicine incorporates the practical, mechanical knowledge of more conventional western medicine, but also explores the more natural, supportive knowledges from eastern sources. At Advanced Health, we generally hold that the least invasive path to wellness is preferable, and we’re very much in favor of treating seasonal allergies naturally. Has this summer got your eyes watering, and your nose running? Why not book a consultation with our integrative functional medicine physician, Dr. Payal Bhandari M.D. She will treat the source of any condition, including seasonal allergies. Contact Advanced Health today, and get yourself on the path to ease, symptom relief, and lasting wellness.